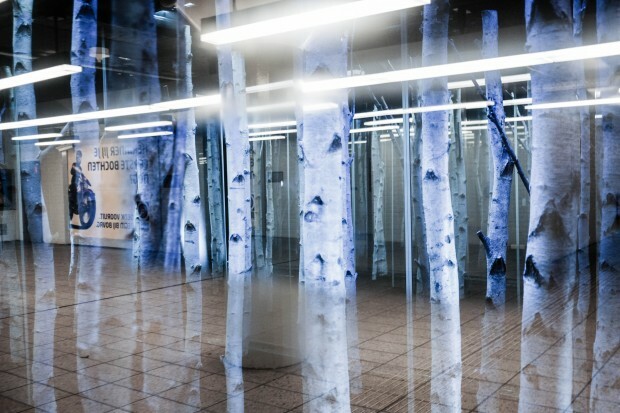 Did you know that there’s a mysterious blue forest in the middle of one of the busiest metro stations? No? You have until November 3 to go to Wibautstraat and be a witness of the unusual phenomenon Kairos, created by Marielin Simons, a Dutch artist and recent graduate of the Minerva Art Academy. Suddenly, you aren’t alone in the sea of strangers, you are in the nature’s hands. 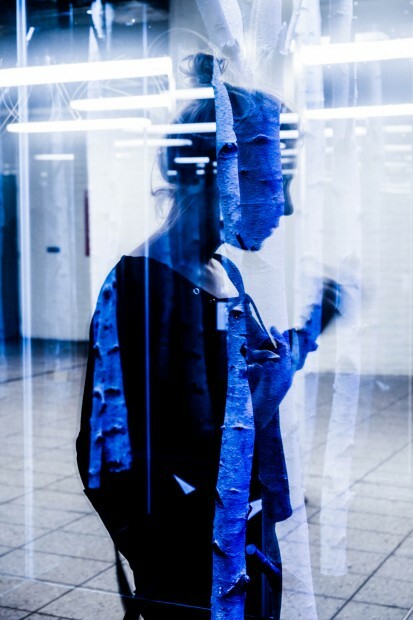 The idea of building the installation, presented in a dark glass cabinet right at the entrance of the subway, was born out of Marielin’s graduation work. A miniature called Birch forest was a personal reflection of the artist’s inner world, where she still cherishes the childhood memories of walking through the unbeaten paths of the Eesergroen’s woods, in the northern part of the Netherlands. “The smell, the frosty wind, the fog, the shades painted by the first rays of light that are trying to squeeze between the density of the trees… everything impressed me so much, that in order to hold on to that particular moment and share my strong emotions with the others, I decided to become an artist”, Marielin told us. It was John Pop from Polderlicht who saw Marielin’s potential and invited her to exhibit, something similar to her school work, but on a bigger scale, at the Wibautstraat tube station. She had almost a year to nurture and to elaborate the idea of presenting nature not in its natural habitat. After everything was ready, she put the work together in three days. Apart from Polderlicht’s help, Marielin also got the funding from Amsterdams Fonds voor de Kunst. Because of this great opportunity her work is out there, for everyone to see and to connect to. Kairos, is an ancient Greek word for the right or opportune moment. The moment that will never repeat itself because it’s unique and fragile. And that’s why it’s so important for Marielin to share with us this instant of peace and rest, provided by the forest, in the busy public space. “Suddenly, you aren’t alone in the sea of strangers, you are in the nature’s hands. 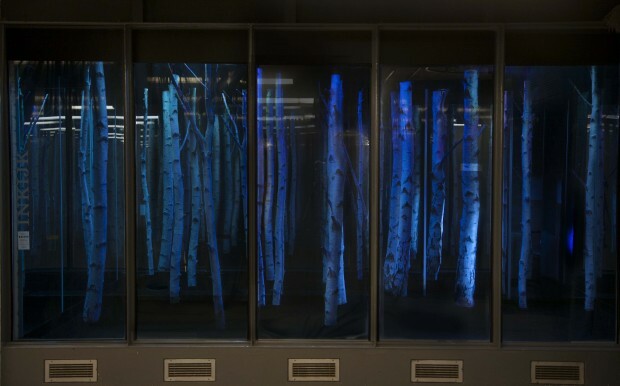 It’s all surreal and mysterious, but it makes you stop, breathe in, see yourself in the glass reflection and for a half of a second, forget about your daily routine and absorb the energy of the woods”, explains the artist.